Fort Lauderdale, FL – The price of gas took a dip, along with the temperatures, across most regions of the United States during the past week, giving U.S. drivers a reason to extend a period of giving thanks. The U.S. Energy Information Administration reported a 3-cent drop in gas prices, bringing the average price of a gallon of regular unleaded to just $2.06. The price of gas along the gulf coast is now only $1.82 per gallon, as the region retained its status during the week as having the nation’s cheapest fuel. The midwest was not far behind, with gas costing just $1.88 per gallon. California and the west coast had the highest prices, with the cost of regular unleaded going for $2.69 and $2.55, respectively. Without California’s enormous economic influence added to the calculation, west coast gas averages only $2.31 per gallon. Fort Lauderdale, FL – The price of gas fell precipitously during the past week, shedding nine cents per gallon, on average, for drivers across the United States. Prices came down in all regions, according to the regular update from the U.S. Energy Information Administration, which reports this week the average price, nationwide, has fallen to $2.09. The price declines have been lead by significant reductions across two key regions: the gulf coast and the midwest, both of which now share the numbers one and two spots, respectively, for regions with the country’s cheapest gas. However, the cost of filling the tank remained nearly the same for most drivers across the New England and central Atlantic regions. The price of fuel only came down two cents across New England and four cents across the central Atlantic. California continues to have the highest gas prices in the country, with the cost of regular unleaded setting one back $2.72 per gallon. Fort Lauderdale, FL – The price of filling the fuel tank came down during the past week, by a nationwide average of six cents per gallon, according to the weekly update from the U.S. Energy Information Administration. The average price of a gallon of unleaded gas is now $2.18, with many regions reclaiming lower prices following last week’s unexpected increase. The costliest place to buy gasoline remains California and the broader west coast, where prices are at $2.64 per gallon, but the price is down three cents from last week. Sans the Golden State, the price of regular unleaded settled at just $2.39 for the west coast region. 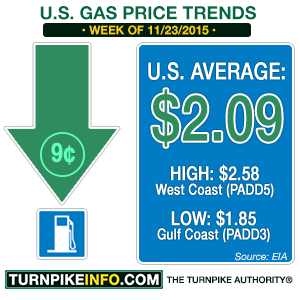 Prices along the gulf coast were the lowest, at $1.93 per gallon. Midwest gas prices endured a radical price swing this week, but to the benefit of the consumer; prices across the region fell an average of 13¢ per gallon during the week. Fort Lauderdale, FL – U.S. gas prices held steady or moved lower, on average, in most areas during the past week. However a pair of survey regions showed prices moving higher, according to the latest data from the U.S. Energy Information Administration. 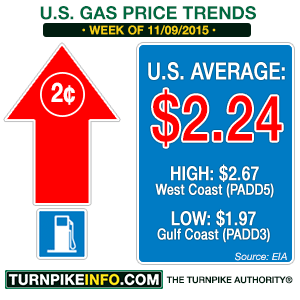 The U.S. average price came down to $2.22 per gallon, according to the weekly release from the E.I.A. Prices along the Gulf Coast continued falling, already well below the $2.00 mark, with the average regional gas price hitting about $1.92 per gallon. The highest gas prices are found on the west coast, where prices still fell to an average of $2.65 per gallon. Without California in the mix, the west coast average fell to $2.35 per gallon.